Catia and Marcin started an interesting experiment, they called pair-writing. Catia blamed me for starting that. I like being blame of things. Seriously. When it is my fault, it means I am in control and I can do something about the mess people are in. (After all it was my fault.) Next to that, I have been blamed of much worse things then making people pair up. I told Catia & Marcin I loved the idea, but I did not think it was pair writing. And then things became really interesting. One of them (the names are left out to protect the innocents ) said that before they could be pair-writing they needed first to increase the trust between them. Interesting because brought us back to the end of their discussion. I have been reading and talking a lot about trust the last years. Everyone with kids knows how hard this is. As a parent I give a lot of freedom to my kids. 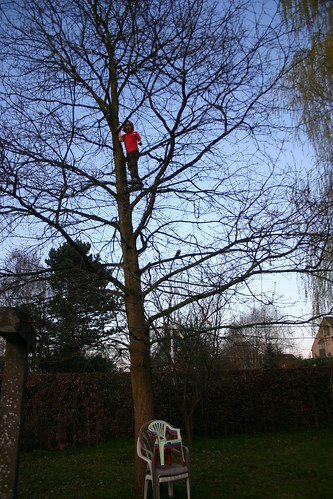 Joppe loves climbing in trees. We let him, even if he climbs beyond the point we still see him. Does it scare me? Yes. Why do I let him do it? Because I trust he can do it. And because I give him trust, his confidence grows and he dares to do it. Now I know I trust people very quickly. And yes I have already been bitten by that in my life (both personal as business life.) So what , I’m sure that even the biggest paranoids are not bitten less then I am. Let’s take the example of our “The Core Protocols an experience report”, that article was written by 15 people. Some of them I never met. Yet I gave them all editing rights to a google doc. Some edited a lot, others send me some text and I added it myself to the article. At some moments I was surprised about some changes. Yes at the end I asked people to be carefull about large refactorings. Yet I never have taken editing rights away. I will say more, I have no idea who wrote what. Is it what I had in mind when M&T ask me to write the article? No. It is in no way what I had in mind. It is 3008 % better. Why? I trusted the people they would come up with good idea’s. Read article yourself and decide for yourself if it was a good decision. Does this mean I still trust everyone? No. Some people in my life have proven that they can’t be trusted. They are removed from my list of people I trust. Can they get back up? Yes they can, but depending on how hard they have been untrustworthy it might take a little longer. Now keeping someone’s trust is hard. This year I have been together with my partner for 15 year. And yes, in these 15 years our relations has not always been as strong as today. My question to C & M is: when you need more trust to write, why did it work to organize ALE2011? Always give trust slightly in advance of demonstated strustworthiness. Update: Although trust should be given not earned, I’m very sceptical when people say: “you HAVE to trust me on this”. To me it sounds like a partner who says: ” don’t you trust me?” It feels like blackmail. And I don’t trust people who blackmail me. And yes I ‘m wel aware of ways to say that, when it does not feel like blackmail. Yet in those cases, there is typically no need to say this. A better way would be: what do you need from me, so that you would trust me with this? I agree with you – and disagree.. Or rather I agree, but I am not able to live it (yet). I believe that trust is very important – and I find it very difficult; I trust most people rigth away and sometimes I am sceptical – it is usually based on my gut feeling, when I meet people the first time. The trust I have, is that people will do their best and that they are good people. But I find it very difficult to trust so much that I let go of having control. Control is (too?) important to me..
And I often find that I have been naive and I get bitten – find my trust betrayed.. Yet I give it willingly to new people..
Oh yes it is hard. I recorded one of the first phonecalls I had with a client years ago. My gut feeling told me I should not work with this person. I did and it my gut feeling was right, that person even asked me to lie to his customers (which I refused). It was a good lesson to trust my gut feeling more. If I today have a similar feeling I say no. Even to good opportunities. What I notice is that my need for control also depends a lot on the situation (system) I am in. With certain people I have a bigger need for control. That has a lot to do with how I learned to deal with similar people (not even them). As long as life of no one is in danger when I trust people , I prefer taking the risk of being disappointed . Not leaving in a trust environment makes me way too miserable. Now, there are people that I can’t simply trust. Is that “female irrationality”? It’s ok to not be perfect! !